Ibanez’s Acoustic Basses offer tone, style, playability, and versality suited to a wide variety of genres and musical styles at an impressive price point – and the AEB105E NT Acoustic Bass Guitar is no exception. Ibanez’s Acoustic Basses offer tone, style, playability, and versality suited to a wide variety of genres and musical styles at an impressive price point – and the AEB10E DVS Acoustic Bass Guitar is no exception. Ibanez' AVNB1E is a short-scale electro-acoustic bass guitar with a Parlour body. It has a solid Sitka spruce top and the back and sides are made of mahogany. Acoustic guitar players will find it easy to transition to this bass thanks to its 24.96-inch scale length. It also has a relatively flat 15.75-inch fretboard radius and the mahogany neck has a smooth semi-gloss finish which both enhance this model's playing comfort. Ibanez' AVNB1FE is a fretless electro-acoustic bass guitar with a Parlour body. It has a solid Sitka spruce top and the back and sides are made of mahogany. Acoustic guitar players will find it easy to transition to this bass thanks to its 24.96-inch scale length. It also has a relatively flat 15.75-inch fretboard radius and the mahogany neck has a smooth semi-gloss finish which both enhance this model's playing comfort. 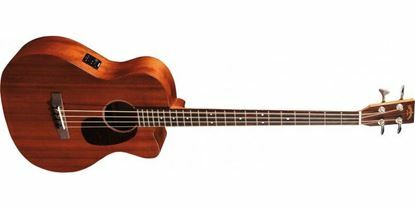 The warm tone of an acoustic bass that's affordable.